#ScottishFamilyBizDay celebrates the family businesses across Scotland that quite simply are the bedrock of communities and the backbone of the Scottish economy. Scottish family businesses come in all sizes, from all sectors and from all over the region. Many of these firms have been in existence for hundreds of years, passing from generation to generation, with their longevity the result of good governance, innovative family ownership and a focus on the long term that has resulted in them becoming the bedrock of communities across the region. Others may be younger in age, but share similar values and are building forward-looking family firms of the future. Studies in the past decade have shown that around 65% of all private businesses in the UK are family controlled and that family businesses in the UK account for around 25% of UK GDP, over 45% of UK employment and generate significant tax revenues for the Exchequer. It is also recognised that a large proportion of the UK’s wealth is held within family businesses and that the family business sector is therefore a force to be reckoned with. Family firms across Scotland represent a significant proportion of all businesses and these firms today are a far cry from the ‘ma and pa’ image of small lifestyle businesses that are often portrayed in the media – they are big employers, create wealth for their employees (many of whom have had generations of the same family working in the business) and invest significantly in the communities in which they operate. The contribution made by the family business sector in Scotland is significant and deserves to be recognised. 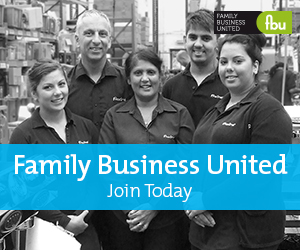 Scottish Family Business Day 2019 is a nationwide campaign to put the family business sector on the map, organised by Family Business United (‘FBU’), the award-winning magazine and resource centre for the global family business community that was founded by Paul Andrews. Scottish Family Business Day recognises the diversity of the sector and provides an opportunity to celebrate all things family business and takes place on February 6, 2019. •Scotland is awash with family firms that make a significant contribution to the communities in which they operate. Family firms have to deal with specific issues associated with their family ownership and it is the relationship dynamics that make them special, and of course, can create unique tensions that are not found in their non-family counterparts. Family businesses that recognise these challenges, develop good governance procedures and focus on the sustainability of the business for the long term, innovating as necessary to keep the business relevant, have the greatest chances of remaining for generations to come. Successful family firms focus on the business and take a long term view, and with a significant number of family business owners looking to retire in the next decade, succession planning and the development of the next generation of family business leaders remains a key item on the family business agenda. Scottish Family Business Day is a chance to share best practice, identify the resources available and to provide assistance to family businesses across the region on the next stage of their journey, as well as championing the cause and recognising the contribution that these businesses make. Family firms are the backbone of the Scottish economy and we hope they remain so for generations to come. Get involved with the online campaign using the hashtag #ScottishFamilyBizDay and be a part of something special.